Friday: Possibly the sweetest word in the working man’s lexicon. I was so happy about today being Friday I decided to take an extended route to work, including a walk though Little Tokyo. 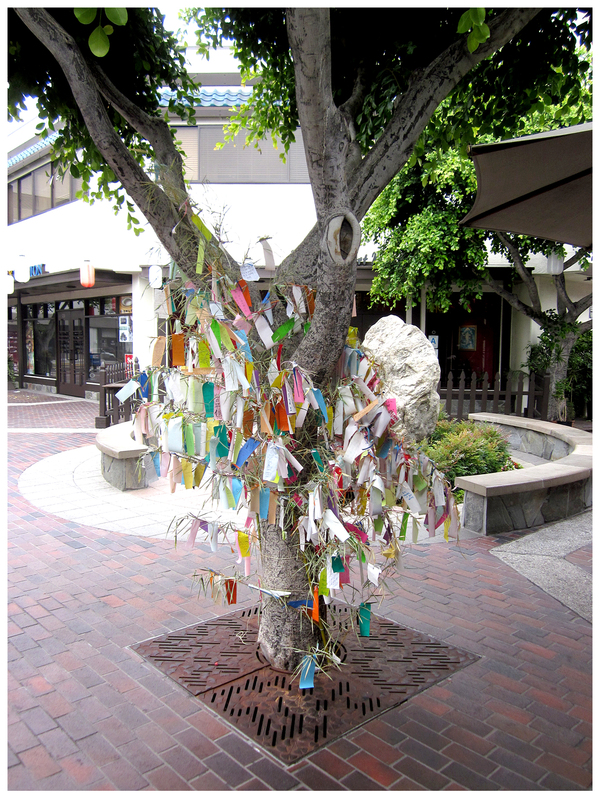 Passing through the Japanese Village area I was met by the colorful paper foliage of several wish trees. Clustered in the plaza between the bakeries and restaurants there, they had the festive look of summertime Christmas trees …. 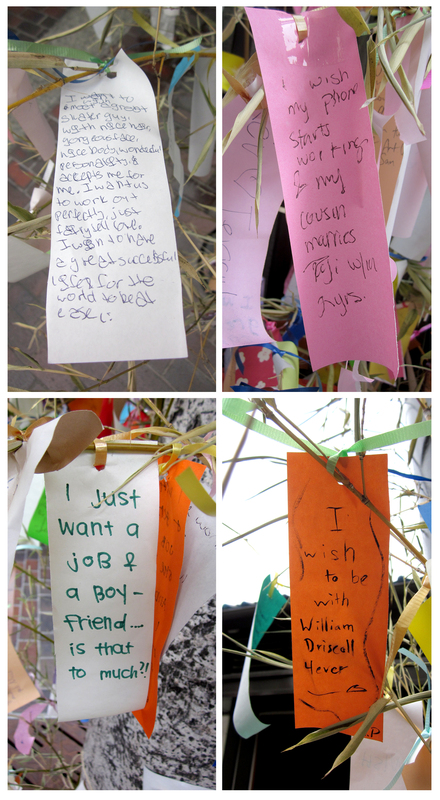 but, just what were the wishers wishing for? 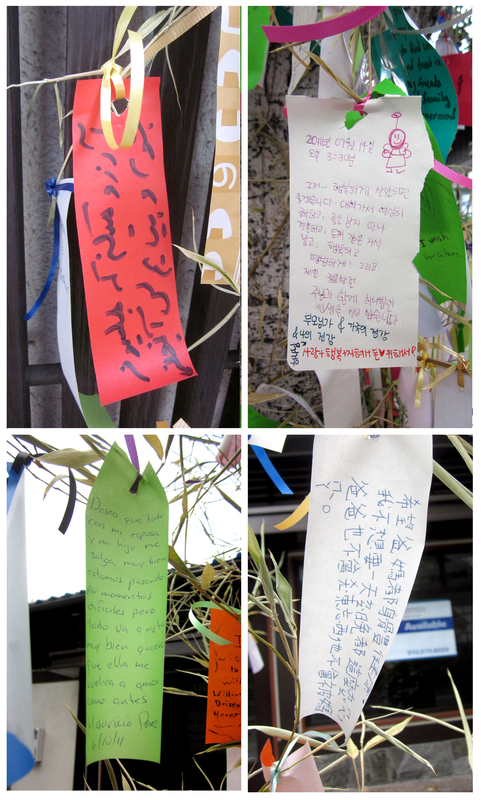 Wishes for good health, a kind-hearted daughter, the safety of a relative in Japan, and a travel commemorative, the wishes for family are poignant and heartfelt. Where love is concerned, no detail is overlooked and include good hair, a good body, a love of skateboarding and acceptance. Others wish selflessly for a cousin’s marriage, to stay with their lover forever and to find not only love, but a job, too. Is that too much to ask? 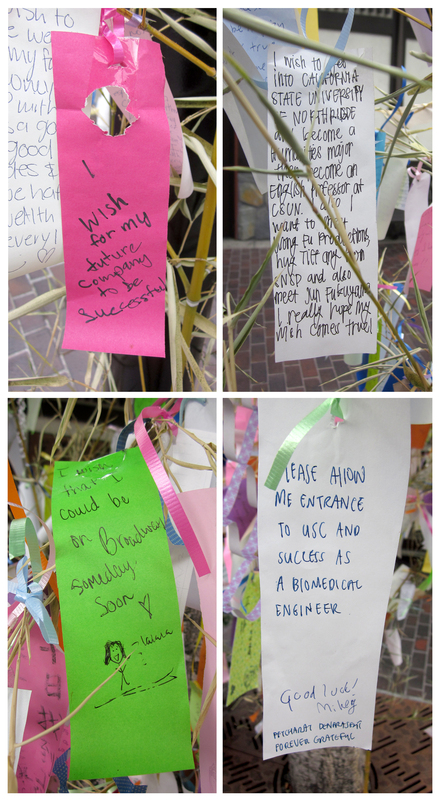 Very specific educational and business success wishes abounded … this being Los Angeles, a wish for a shot at showbiz success doesn’t surprise. 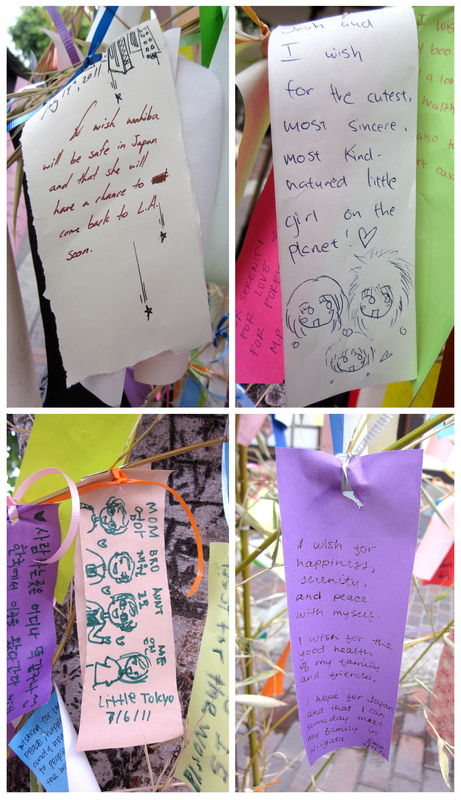 Also very L.A., wishes featuring foreign characters and languages. In green, a man wishes in Spanish for the return of his wife and child during difficult times. My favorite wishes are outta left field: a nutty beach wish, a wish for trippy freedom, for a ghostly gallery show this year, and for the return of Oprah Winfrey to help assuage the boredom of unemployment. 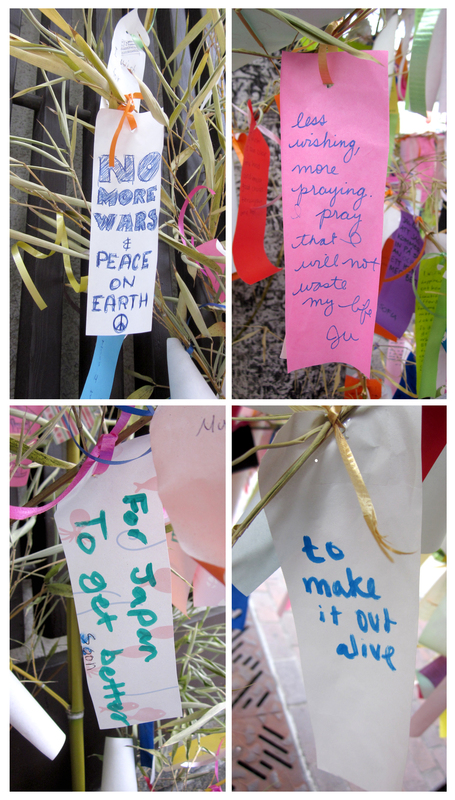 Many of the wishes were for the larger good; love, peace, an end to war, and Japan’s safety, figured prominently. More personal, one wisher hopes not to waste his life, another just ‘to make it out alive’. I WISH EVERY DAY WAS FRIDAY. 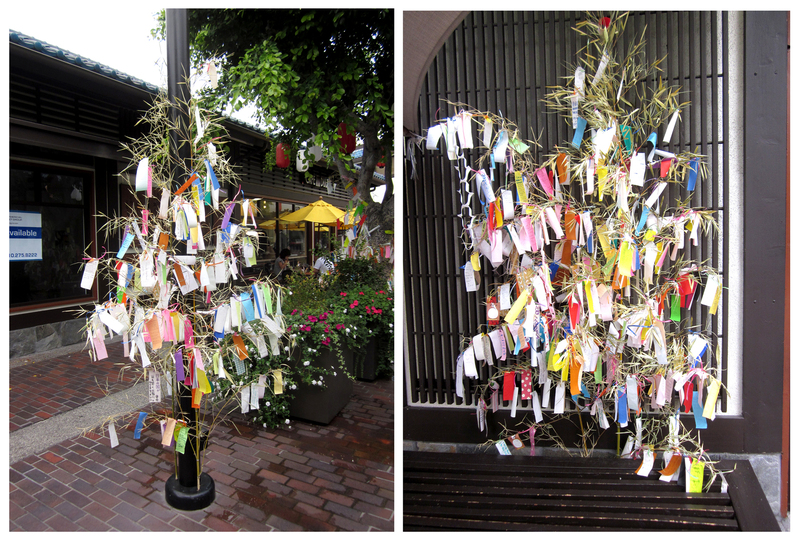 I first saw a wishing tree outside the Buddhist Temple nearest Little Tokyo and all the wishes were in Japanese– and now these ‘wish trees’ have ‘gone international.’ If you stood outside the La Placita Old Church/Mission (but it wasn’t a mission) at Olvera St. you’d see a ‘wish altar’ to a little Nino Jesus’– mostly parents desperate for their children and families. We all have souls crying out to a Higher Power. God bless YOU as you share your artistic ‘eye’ and talent with the rest of us.